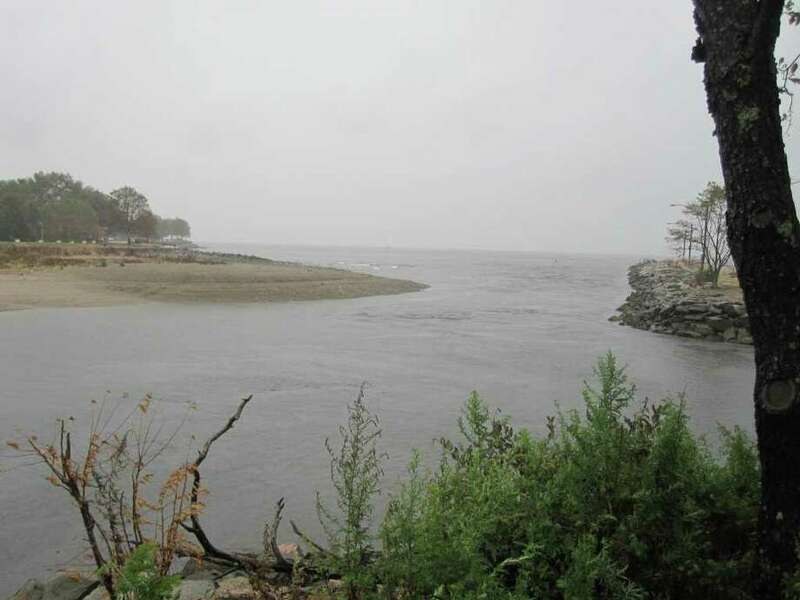 A rainy day view from the end of the Penfield Mills peninsula afford a close look at Ash Creek emptying into Long Island Sound. On the right is the inlet to the South Benson Marina. We can't always rely on sunny summer weather in New England. Not counting extraordinary visitations from Irene-like storms, we will inevitably have clouds, rain, and sometimes, a lot of rain. On the day of this writing, for example, it has been pouring steadily since last night with no sign of letting up. Should I call off my walk through Penfield Mills Open Space? No way! There's no law against walking in the rain, and in fact, a walk in the rain has clear benefits. A rain-walk is water play, adult style. There's a certain joy, a certain freedom, that's unleashed splashing around out there. But there's another reason for its appeal. In the rain, familiar places are not quite as familiar. Visibility is reduced; colors flatten toward grey; the rain washes through the trees in a continuous roar. The gloom that descends on the place adds a whiff of adventure, perhaps because you will very likely be alone. After all, who else would be crazy enough to be out in this weather? So join me for a virtual walk in a steady downpour. Penfield Mills Open Space is named after the man who built tide-powered grist mills over Ash Creek in the mid-1700's. The town wisely acquired the 24-acre property in 1967, rescuing it from residential development. Take Turney Road to the South Benson Marina and make a left past the gate house. Go all the way to the parking lot, where, at either end, you can find two different walks. Just to the right of the town's boat launching ramp is a 300-yard trail (a bit muddy today) lined with coastal vegetation atop a peninsula that separates Ash Creek, on your left, from the marina. Ash Creek is the terminus of the Rooster River, which together form part of the Fairfield-Bridgeport border. At the end you will have a great view of Ash Creek joining the Sound, and the inlet to the marina. Rising out of the creek is the Great Island Marsh (another Open Space rescued by the town and the Aspetuck Land Trust), and beyond it, through the mists, is the Saint Mary's By the Sea neighborhood of Bridgeport. On a sunny day, one might sit on the bench and enjoy the breeze off the water, or watch boats enter and leave the marina. But today I took just enough time to feel the mist on my face and watch the tide rush out to the grey, forbidding waters of the Sound. I was about to turn back when a solitary boat made its way into the marina. The skipper, in his foul-weather gear, gave me a wave that spoke of exhaustion and relief. At the other end of the parking lot you can choose one of three ways to enter a small trail system that has meadow, wooded, and coastal features. The left-corner gate entrance takes you to a shaded area with several picnic tables and views of Ash Creek and Great Marsh Island. Even diehard rain-walkers draw the line at lunch al fresco in these conditions, so I moved on to a segment of trail that will run along the shoreline, or keep to a wooded trail with intermittent water views. The trail loops back to the parking lot through a meadow or through another wooded area, or you can take a marshland spur trail to Riverside Drive to see a self-regulating tide gate very much like those at Pine Creek. Just beyond the parking lot fence in the meadow is a very appealing playground, but this was not the day to try the slide. It wasn't the Lewis & Clark expedition, but despite a rather soggy pair of pants I came home with a sense of accomplishment and a new way of looking at Penfield Mills. Ordinarily, the birding is really good there, but what bird is crazy enough to be out in that weather?